One of my favorite things about the holidays has always been crafting with my mom. I love spending that one-on-one time with her, just being creative. One year we made candles, another year we made essential oils and bath salts, and another year—ornaments. We always try to stretch our dollar as far as we can, so when Becca presented the $20 tree trimming challenge this week, I decided to call in my mom for a little backup crafting advice. I found two packages of these foam balls (to use as my base) and some Mod Podge (matte finish) at Michaels for a total of $13.62. Then I gathered the rest of the supplies from my house—twine, a paintbrush, scissors, permanent markers, scotch tape, and old book pages. I started by tearing my book pages into small pieces, about the size of a quarter. Then I taped a piece of twine to the foam ball and started gluing/sealing the book pages by brushing on Mod Podge. I found that overlapping the pieces was most effective in getting a smooth texture. 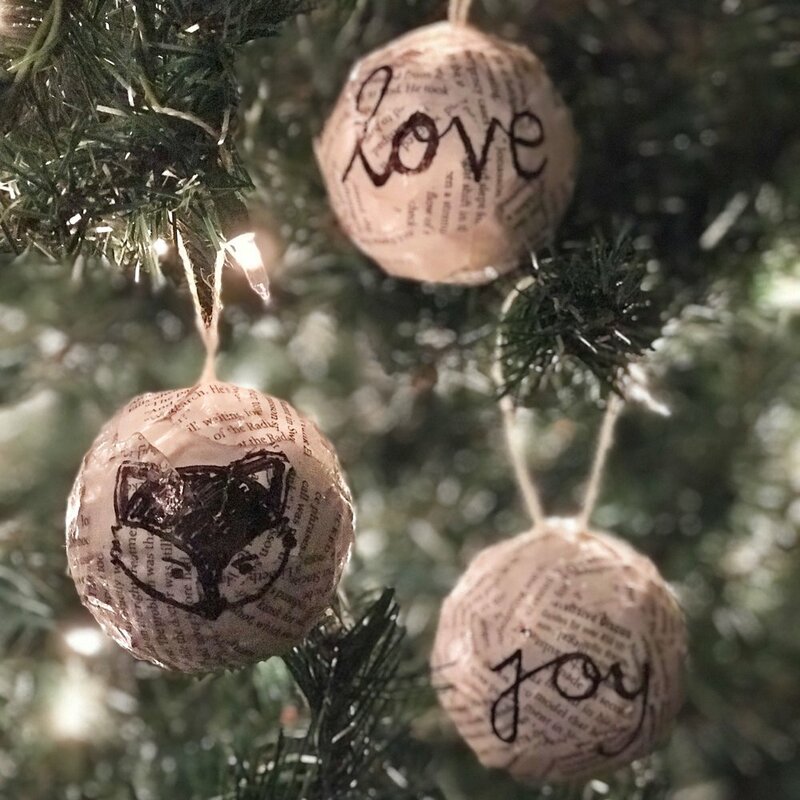 It takes a few hours for each ornament to dry fully, so I placed the ornaments on a piece of parchment paper during that time so they wouldn’t stick to anything. And once the ornaments dry, you are free to draw or write on them! There are so many options for these—I had a great time playing around with different designs and words. Total cost for 12 ornaments: $13.62!